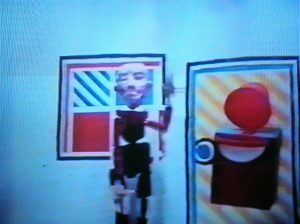 In 1965 James Reaney created three marionette plays: Apple Butter, an original work, and two adaptations, Red Riding Hood and Aladdin and the Magic Lamp. Leith Peterson describes how her mother, Jay Peterson, came to commission the plays and help create the marionettes. The plays were performed by James Reaney and friends at the Western Fair in September 1965 in London, Ontario. My mother, Jay Peterson, and Jamie [James Reaney] had a lot in common. Both were highly creative people who were good at getting projects not only off the ground, but also seeing them through to fruition. Mom, Jamie and Colleen teamed up on a number of adventures over the years, but the focus of this presentation will be Jamie and my mother’s 1965 Apple Butter collaboration. From 1963 to 1970, my mother was a director of the Western Fair, so this is the fair Jamie is referring to. Apple Butter was one of three marionette productions commissioned for the 1965 fair. Greg Curnoe’s anti-Vietnam war piece called Red, and Jamie’s Aladdin rounded out the trio. My mother saw these shows as not just entertainment for children, but for adults as well. 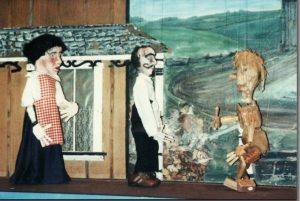 The Apple Butter marionettes were made at my grandfather’s old print shop at Leith, Ontario. 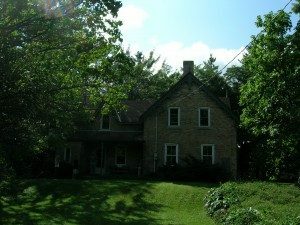 In his diary entry for August 23, 1965, Jamie chronicles my mother driving the Reaney family up to stay at the Peterson cottage, which was close to the print shop. Then on August 29, Jamie pens that his sister Wilma picked up the Reaneys and took them back to London. 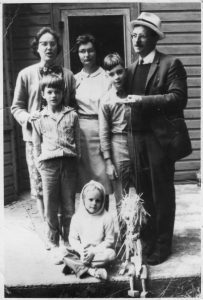 There is a wonderful photo of the Reaney family, including John and Wilma, on the front steps of the Peterson cottage. Jamie is holding Apple Butter. The Reaneys with Apple Butter, August 1965. Photo by Jay Peterson. I was at camp at the time the Reaneys were at Leith. However, Colleen, James, and Susan have provided details. In addition, I have asked my brothers, Stuart and Donald, for their input. Stuart remembers the Reaneys being at Leith and hanging out with James and John, but his only clear recollection is of James trying to convince him that the Dave Clark Five were better than the Beatles. Jamie created Apple Butter, Treewuzzle and Rawbone. My mother made the heads as well as the papier-mache hands for the adult characters. Mom also designed Moo Cow — an impressive-looking bovine, with the map of Canada on one side, built into the Holstein’s black and white markings. 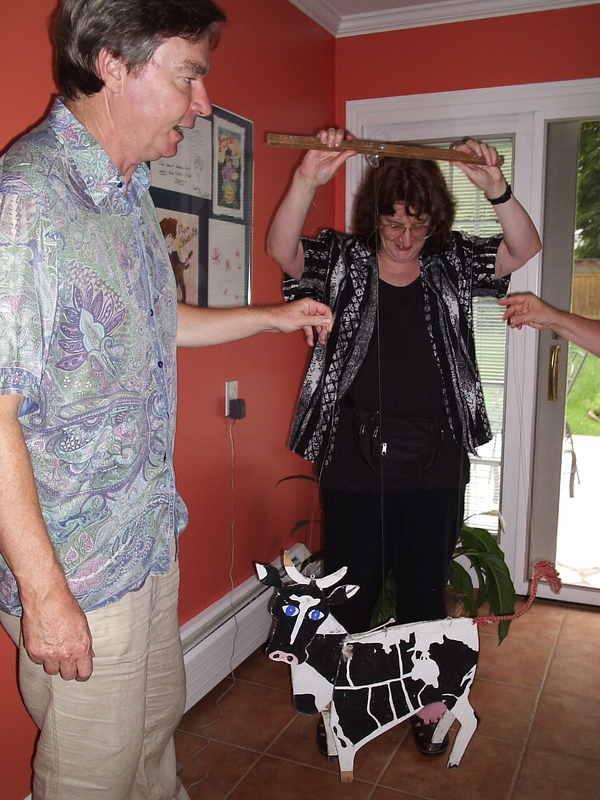 Leith Peterson shows off Moo Cow, August 2008. Photo by Susan Wallace. Apple Butter went on to further acclaim in other locations. After the Woodstock production, Jamie enthused that “children practically accompanied Apple Butter right to the station.” In his 1968 biography of Jamie, Alvin Lee noted that Apple Butter was an adaptation from a simple folklore story “with a built-in appeal to the young, as the enthusiastic responses of hundreds of children have shown.” And there was also a built-in appeal for adults, including my mother and Jamie, who had so much fun bringing it all together. 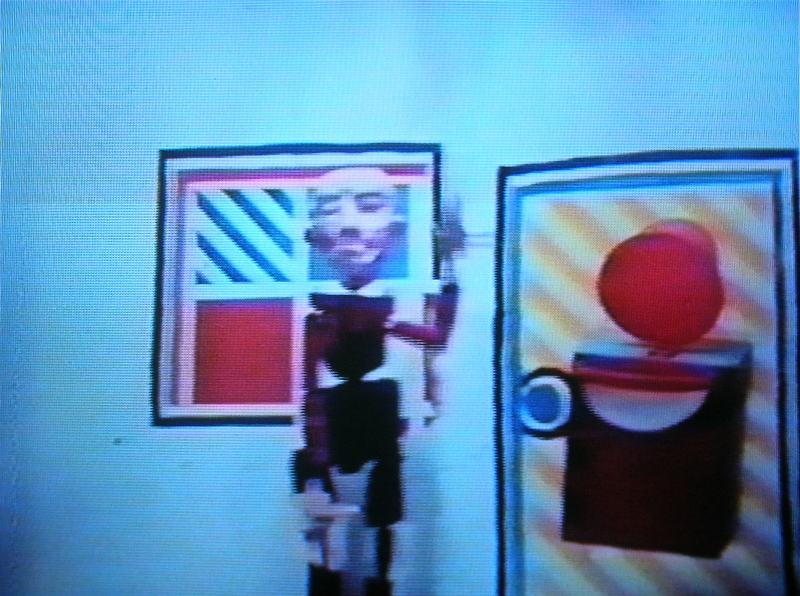 I’m happy to know other people love Apple Butter, one of the marionettes created by my father in 1965, as much as I do. Apple Butter and several other marionettes from the 1965 play by dad were collected today & are en route to the Canadian Museum of Civilization. One of the marionettes, Moo Cow, was created by the late Jay Peterson, who helped clear the way for these remarkable characters to play the 1965 edition of the fair. The marionettes, including Apple Butter himself, have undergone some modifications since they first put their strings in front of the public. But it’s a real honour to see such interest & I know dad would be proud. My only regret is that Jim Anderson’s magnificent set for Apple Butter disappeared somewhere over the years. It was a classic look at a Souwesto home.